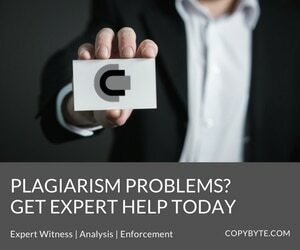 When dealing with content theft and plagiarism matters, knowing what to say can be as important as knowing who to say it to. So, in order to help people who are preparing to send their own cease and desist letters or DMCA notices, I’ve prepared a small collection of stock letters. Though these are the actual stock letters that I use and they have been very successful for me, as with everything else on this site, do not take these letters to be legal advice. Use them at your own risk. Note: A cease and desist letter needs to be flexible. My letter is targeted exclusively at plagiarists. This means that certain parts of this letter may not apply in other cases. Please read this note carefully and edit to suit your needs. You are using a work that I own the copyright of. The name of the work involved is “<<WORK NAME>>”. It appears on a site operated by you at <<INFRINGING LINK>>. I have reserved all rights to this work, which was first published on <<ORIGINAL LINK>> in <<YEAR OR DATE OF PUBLICATION>>. Your copying and or use of my work, which appear at the link above, is unauthorized. You neither asked for nor received permission to use the piece nor to make or distribute copies of them in the manner you have. Furthermore, you have taken credit for my work and caused confusion as to whom the original author of the work is. Therefore, I believe you have willfully infringed my rights under 17 USC §101, et seq. and could be liable for statutory damages as high as $100,000. Further, such copyright infringement is a direct violation of the Digital Millennium Copyright Act and International Copyright Law. 6. I have a good faith belief that the use of the material that appears on the service is not authorized by the copyright owner, its agent, or by operation of law. 7. The information in this notice is accurate, and I am either the copyright owner or I am authorized to act on behalf of the copyright owner.